Collected here are the publicly available recordings of past events of the Georgian Papers Programme and other GPP AV content. The Georgian Papers Programme and Digital Humanities. Presentation by Arthur Burns, Samantha Callaghan and Patricia Methven to the Digital History Seminar at the Institute of Historical Research, London, 12 March 2019. See the virtual version of the Exhibition Mike saw here. Talks by Arthur Burns and Karin Wulf, programme directors, and Jim Abuske (OI GPP fellow) and Andrew O’Shaughnessy (SAR Visiting Professor) on their research in the archives, and an introduction to the role of the Library of Congress in the project. Click on the image to listen to an audio recording of the event. Mapping the Georgian World: Global Power and Maps in the Reign of George III. Arts and Humanities Festival, King’s College London, October 2017. This panel brought together Peter Barber, the leading authority on George III’s map collection and former head of the Map Collection at the British Library, and Dr Max Edelson, a leading authority on the mapping of colonial America and a pioneer of its digital interpretation, to discuss the place of maps in the exercise of rule and authority in the eighteenth century. 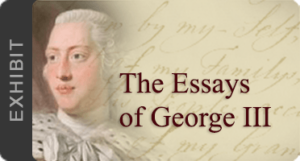 Dr Bruce Ragsdale on George III and agriculture: Lunch and Fellowship at the Fred W. Smith National Library for the Study of George Washington at Mount Vernon 23 March 2017. The Washington Library’s first Georgian Papers Fellow, Dr. Bruce Ragsdale, discusses his work at the Royal Archives in London and Windsor Castle investigating George III . ‘Just write it, I’ll make it work’: Alan Bennett and Nicolas Hytner discuss The Madness of King George, Arts and Humanities Festival at King’s College London, October 2016. The opening event of 2016’s Arts & Humanities Festival,, “Play”, explored King George III through the eyes of Alan Bennett and Nicholas Hytner, in a talk chaired by Professor Alan Read. 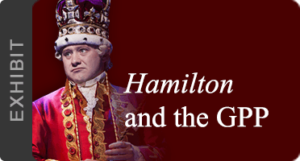 They discuss researching archives to write The Madness of King George, the challenges of translating an acclaimed stage show to a multi-award winning film, and how they see George III. A short introduction to the project from 2016, including contributions from Arthur Burns, Andrew Lambert, Elizabeth Eger at King’s College London.